Michael: Welcome back to the show. I'm here with Rakshith Naresh. I hope I'm saying your name right there. I had to practice it several times. Michael: Excellent. He's the Senior Product Manager for ColdFusion Adobe, and he's the guy who decides the future direction of ColdFusion there. And in today's episode, we're going to be looking at the ColdFusion 2018 roadmap that they're working on, and be released in a few weeks’ time on the Adobe site. So, we're going to start off by looking at how ColdFusion has changed in the last few versions, and what particular features they're focusing on for ColdFusion 2018 that's going to be released next year. And also, we’re going to look at how they decide what features to add, and the long term commitment of Adobe to ColdFusion. And if I can squeeze Sir Rakshith’s binds back we'll find out how to ColdFusion sales are going. So, welcome Rakshith. Rakshith: Thanks a lot Michael, it's great chance to be on this podcast. Michael: So, how has ColdFusion changed over the last few versions? I think you have a slide you want to share with us, show some detail on that. Rakshith: Absolutely, so in fact, we've had a transformation over the last few releases. [Inaudible] want to go for us Michael has been to make sure that ColdFusion is the most stable, and productive back in out there for any kind of business logic that you can host, is still across the host of bind sight technologies. So, that's a strong reason that we plan, and we’ve executed the web region over the last few releases. So not just the next version coming up, but we've done interesting work associated with that over the last few releases. So, I'm just like to show you the slide that talks about it that this just represents more I tell you about. Let me just go ahead and scare the screen here. Can you see my screen now? Michael: Yep, I can see it now. It's showing the transition from ColdFusion 10 through 11, and ColdFusion 2016 coming into 2018. And I am just narrating a bit for the people who are listening on audio, and may not be able to see the slides so. Rakshith: Absolutely great! So, what you see on the left hand side Michael are those various access the people work on. So, the number one expectations that our customers have from ColdFusion is to be a really high performing, and a skilled will platform because the host of critical business logic on the platform itself, on their web allocation platform. So the basics that customers have is to have a really high performing, and scalable platform. So, we’re doing that beat the expectations every single release. The second one is on security. As you possibly know that only more and more [inaudible] are being discovery every single day. So obviously, our customers want to have a really secure platform on which they can run the business on. So, that's the security can be used to be a second need. The third one is productively. As most of us know, ColdFusion is the most productive platform out there for web application development. So, our customers and developers have this expectation that they want these productive features associated with a new version of the product. And the last one is being future ready. So for instance, but they're [inaudible] [03:35] customers, and developers are interested in a particular technology. They want to make sure that the applications that they build are ready not just for today, but for the future as well. So, we actually work on these axis to transform the product from one version to another. So just to give you a sense starting off with ColdFusion then which is released a great well. We started working on the product sometime in the year 2010. So, the words are high performing in a scalable platform. The opportunities that we had back then was on the H.T.M.L. 5. And back in those is REST based of services we're getting quite popular mostly because of mobility. So, what we did was we used this opportunity of H.T.M.L.5. So Adobe was kind of not focusing ready really on flash, and H.T.M.L. 5 was picking up. At the same time, REST based services are getting really popular because web services [inaudible] SOAP. So what we did was we came up with this [inaudible] of features that actually enable our customers to use this opportunity and build something really interesting. So, that was ColdFusion then through the transition from 04:43. We also made the platforms secure by … So, we’ve improved the security access quite a bit over the past last few releases. On the productive release side of things, they came up with the big and respite services. So, we just a few lines of code, our developers can expose the existing business logic as risk based services, and for being future ready, we came up with H.T.M.L.5 support with the built in web app support as well as a stream of [inaudible]. So that was ColdFusion then. Now, the next opportunity to be focused on, but remember the vision was to ensure that we become the most scalable, and productive platform. So do the words that our vision is to be focused on multiple opportunities starting out with H.T.M.L. REST, then ColdFusion 11 it was all about mobility. So, can we have developers be interested in mobile application development [inaudible] applications using mobility as a space? So that was ColdFusion 11 where we focused on creating a high performing P.D.F. engine to improve the performance, we introduced to [inaudible] features to enhance security, or it's just PDF improvements. And finally, the mobile application development platform itself. So, that was ColdFusion 11. And ColdFusion 2016 was the next port of transformation where we focused on A.P.I. management. So, now that we have H.T.M.L.5 and REST services all with mobility coming in, we’ve realized that our customers will want to expose to the A.P.I. management platform. So we can operate the built in A.P.I. management platform, and transform ColdFusion itself to have an A.P.I. management platform itself for in ColdFusion 2016. Now, the next opportunity that we have in front of our is Microsoft services. So, what we are seeing increasingly is that once you have A.P.I. as our customers would want to have those A.P.I.’s exposed as microservices that can scale independently. 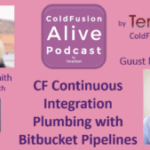 So, that's the next opportunity that we’re looking at for ColdFusion 2018 aether coming up in the next [inaudible] [06:52]. So if you look at all the opportunities, all of whom actually are related. You have REST [inaudible] [07:00] kind of converging all of these … words to make sure that ColdFusion is the best platform for hosting business logic across any kind of plan. Be it the mobile plan, or be the web based applications. ColdFusion with the vision going to be used to be make ColdFusion the best platform out there for any kind of consumption from the client side. So, that's the solution, and this is how your transformed the product over the last few releases as well with the most recent one being the A.P.I. matching platform which is really interesting because we'll get the traction for this A.P.I. management platform and they're introducing or through ColdFusion 2016. Just to give you some sense of the data, 71 percent of our customers already be REST based services. So for them to expose those services using an API management platform makes all the more sense and in a lot of traction specificity on the A.B.M. management platform. And I am quite excited about the deductions that we have, and even the future directions will be focused quite a bit on the A.P.I. management platform itself. So, basically this is it here transformed the product over the last few releases. Michael: So, the A.P.I. management is for your own A.P.I.’s that you create. Is that right? Rakshith: The A.P.I.’s are the [inaudible] [08:25] A.P.I.’s. Let me just… another bit of the stop it let me just show you. Just stop the sharing here [inaudible]. And just like to quickly show you what is it, and what we’re trying to do with the A.P.I. management platform. Let me just go back and share my screen because this one slime will give you a really good understanding of what we're trying to do with the A.P.I. platform. So, go and share this. Share my screen. So, can you see my screen now? Michael: It's loading up. There it is, yeah. Rakshith: Okay, so when I say A.P.I.’s, these a customary A.P.I.’s not ColdFusion exposing A.P.I.’s. These are A.P.I.’s that are exposed by ColdFusion developers to their end customers. So that’s the A.P.I. [inaudible] REST … is a SOAP based services. Now, I just want to get quickly highlighting what we're doing with A.P.I. management platform. So, these are typically the steps that I need to be followed by our customers to begin A.P. I. … to be on A.P.I., and take it from onset to a production stage. So, Step Number One is where our customers define a set of business objectives. Why do you even need to have an A.P.I.? Who is the target audience? All that happens in Step Number One. Step Number Two is where are the developers design the A.P.I. Do I use SOAP based web service, or REST based web service? All that decision happens in Step Number Two. Step Number Three is where you actually code the A.P.I. You can choose CFML, or you can use Stock Net, P.H.P., any backing technology to code an A.P.I. So, the coding happens in Step Number Three. It doesn't end at just coding the A.P.I. There are a lot more steps that are needed to actually take an A.P.I. to production. So those are the additional steps that I have on the slide there. Step Number Four is where developers need to secure the A.P.I. [inaudible] access control. You don’t want anybody to start accessing your A.P.I. You need straight access control mechanisms in place. So that is Step Number Four. You also need to protect the A.P.I.s against various A.P.I. based vulnerabilities. All that happens in Step Number Four. Step Number Five is where our developers need to manage the various versions of the A.P.I. perhaps also have and this earlier service level agreement using which they can expose the A.P.I. to their customers. For instance: that platinum customers get to access A.P.I.s in unlimited fashion. Gold customers get to access only 60 from the net. All that [inaudible] definition of … happens in Step Number Five. Step Number Six; really important step. Step Number Six is where developers who are trying to consume the A.P.I. try to engage with the company of the customer who is trying to expose the A.P.I. They try to understand the documentation associated with the A.P.I. Even trial and the A.P.I. without having to write a single line of code. All that happens in Step Number Six. Step Number Seven is a really important step again which is measuring the impact. For instance, how do ColdFusion developers even figure out if their A.P.I. strategy is really working out well? For that they need it in analytics to figure out who's consuming the A.P.I., what has been the average data out to produce these A.P.I.’s. So these are the really steps needed to take an A.P.I. from concept to production. What was happening with ColdFusion 11, or versions before ColdFusion 11 was that ColdFusion was just focused on Step Number Three which is coding the A.P.I. Now with the new A.P.I. management on the A.P.I. management platform execute are steps three, four, five, six, and seven axis control is a big thing, [inaudible] [12:23] on A.P.I. is a big thing. We have a management platform for the A.P.I.s where developers can manage multiple versions of the A.P.I. Also manage the lifecycle of the A.P.I. [Inaudible] using which you can expose you’re A.P.I.s and let developers read documentation associated with the A.P.I.s. And there’s also based in analytics capability for the A.P.I. using which they can figure out which A.P.I. is not doing well, what's the average data … And also get insights about the usage of the A.P.I. Now all this is happening with the A.P.I. management platform. So, our developers don't have to worry about any of these steps other than Step Number Two where they code the A.P.I. And rest of the steps are taken completely by ColdFusion’s A.P.I.s management platform. And this is something transformational ColdFusion was never able to do anything like this in the past and this sense this so much of relevance to ColdFusion audience here. This is a reason why you're seeing a lot of traction for the new A.P.I. management platform that be introduced in ColdFusion 2016. Michael: That's great! So, previously developers would have to do at least the other steps manually, or they may not even do them right because they weren't sure what to do there. Rakshith: Exactly, you've got it right. Absolutely, that's correct. Michael: Well, that's great. So, you mentioned several other new things coming in ColdFusion 2018. I think you've got a containerized platform. Is that going to be with Docker or some other container or? Rakshith: Yes, that is more shut down. Actually, our developers don't have to wait for ColdFusion 2018, or [inaudible] [14:10] next year. So sometime this year, we will have official Docker images available for … as a Docker image so that they can hysterically start to get the concrete in and out of the official document. So that's happening in the next few months. We're also looking at 14:30 Open Shift platform as well. So we're already in the need of you as an [inaudible]. You're also looking at shift Open Shift Banking platform as well. [Inaudible] here are already leveraged the platform … of a kind a containerized platform. So, that's the more shocked don't happen sometime this year…ColdFusion … we will have that going. Michael: Great! Well, we'll talk more about ColdFusion summit later in the episode. But I'm excited about the containerization because I know some folks have already being doing that other ways. So having the official images from Adobe will be great. Michael: And then I notice also you've got asynchronous programming listed as one of the productivity improvements in ColdFusion 2018. Tell us about that. Rakshith: Absolutely, so one of the primary focus areas for the next version is on performance Michael. So, what we're doing is of be on improving the performance of the runtime itself. So, ColdFusion 2018 will be the most [inaudible] [15:38] performing runtime that you can expect over the … Basically, it will be the high performing platform with all the runtime improvements in place. You're also looking at supports for distributed cache as well using which all of caching can actually be distributed, or at all flowed on where different server itself and all the nodes of the ColdFusion cluster, they’re also distributed cached effect information in and out of the cache. So that is one of their enhancement that we’re doing to support a distributed cache. The nice thing about the distributed cache feature said is that you can also plug in your own distributed cache engine as well. Still using which even via the [inaudible] support a few set of a certificate gash offerings. But if somebody wants to plug in their own offering, they can easily do that with just a few lines of C.F.M.L. plug. So that's on the performance side of things. What we also realized is the tools that are needed is not just the runtime improvements that our customers are looking for even the tools associated with [phone ringing] [16:44] is something that we are really actively looking forward to. So we are planning to come up with a performance management suite which is a set of tools using which you'll be able to figure out potential bottlenecks in your application. For instance, if there is any issue between your web server and the ColdFusion applications server through the connective configuration. So, there will be how to connect a … that will ensure there is optimal connection between web server, and application server, or any kind of issues within the server itself, we will have a revamp monitoring solutions of the performance management suite which will figure out if there are any kind of issues in the JBM, its database the bottleneck that will be a very good morning to solution available. And that is level number two. We're also looking at profiles of what is the issues within the application itself? What is the best specific lines of code which are actually causing the problem performance? So we are planning to come up with the … as well. So multiple tools will actually form this performance manager and that is an … that we’re focusing on for the next version of the product, and the performance side of things. Michael: Wow! So that will help us have faster apps, have servers that start faster; that kind of thing. Rakshith: Absolutely, that same thing. The reason Michael, so I just want to touch upon the reason why we're focusing so much on performance. What we’ve realized was based on the one on one conversations we’ve had with customers and also various road shows we’ve been having over the last couple of years. I realized that based on the conversations that 71 percent of our customers have goals associated with improving the performance of the application. You want to improve the end user response time, make sure that the service is available perhaps at [inaudible] [18:48] nines like 99.99 percent of the time. They want the service to be… ColdFusion service to be available to ensure that they can do business. So this is not the A.P.I.s of codes that customers are striving towards being that …, being there with …, being the ColdFusion developers. All of them are working towards this goal of improving the performance, and scalability of the platform. Now, if you would just focus on one time performance of the previous version. With this version, with the dual said, we will give our customers the power to extract a lot more out of their existing investments in ColdFusion to make sure that it's an extremely high performing platform. That's the whole idea, that's the reason why I get interested so much on the performance side of things for the next version of the product. Michael: Well, I think that's exciting to a lot of people listening. You mentioned security has been a focus for Adobe on ColdFusion for more than five years now from Version ten through 2016, and now 2018. What new security things can we look forward to? Rakshith: Great! Thank you, thanks a lot for that. Michael: And then you mentioned you're doing some language improvements as well. Can you tell us any of the language things that you're doing? Rakshith: So language is one of you that you're always excited about because developers love anything to do with the language improvements. So, we're looking at really its absence to improve the language for the next version of the product. We’re introducing new object oriented speeches for around for C.F.C.s. For instance you can do in how to Dane's And if you introduce the concept of an abstract company either days of implementing an interface will be so much more there are. So that's not to do it it's side of things. So we're doing our significant —–market happens on that We will soon have a —-previous as well. I want to mention that as well so we will soon— who with only truly use of all is usually when h— ColdFusion 2018 with all the language Hansen's back now. So that will be something interesting for our developers to just —but I feel the best to just jump on that really isn't trying out the language features and give us — of the feedback. So, really looking forward to that. So that's just the one NOT TO DO NOT a cow can how would. Michael: How would people sign up for that? Is there a beta program, or it's open beta? Rakshith: It's an Alpha program actually only of Lebanon not even enough for stage right now. It could be a pre-algebra– that it was in our view. So just the developer is going to keep an eye on a lot start.— ColdFusion.com at the —-So I'll be making a post very soon opening up a survey where developers can actually fill out the survey and let the listeners know that they are interested to participate in a release program for ColdFusion 2018. So that's the way to get in. Michael: Great! kamu —look forward to that coming out now include the link for that on the show notes. And then, I think you mentioned B.D.F. was part of this release. Michael: Can you tell us what that is, and why it's important? Michael: Great! Well, I know some folks will be excited about that. I noticed asynchronous programming was mentioned on your slide. Is that a feature or? Rakshith: Yes I missed the docking of market story so so yes to s— So, this is again related to performance, so little as a said performances significant focus here for the next version. So easy programming is a new set of concepts that we will be introducing as a part of ColdFusion 2018. It's so much more beyond CF thread. CF thread just gives you the ability to create a thread, and that's about it. But now, with — AC programming planning to introduce the concept of futures and promises and for quite a framework —heme using which actor look and actually is running in class So let's say if. –I know intensive and it doesn't have to occupy the main thread of the web application, our developers can easily offload that now program— and so that the contradiction happens on a different thread altogether. And once the result is available, the main thread can just get out from something going to.— to make your web application so much faster. So, that is a really interesting area for us and I would love to hear your. — developers feedback when they get on the P.D.F. for the next version of the product. Michael: Yeah, that sounds interesting. So, I've got an overall question here for you which is you know how do you decide what features you are going to add into ColdFusion 2018, or any future version? Are isn't it that the last estimate is that even some of our medimum sized customers who gives us just a million also or that who choose to have a series of approaches the ColdFusion marketing team and several years ago but this year, we had various road shows across the state activists who choose across six states So I don't present it ideas on performance; the ones that I told you about. The performance management=– we on the security side of things hope your plan to come out with that automation or.Other language which said to us against the programming. I spoke to you about —They improved during Texaco support they group media support. What I then did was I gave the audience 100 dollars—- So now that you have all these focus areas of bravado and security, language and BDF. So let's see if you had 100 dollars to invest on a particular feature or a set of features. So our customers are very liberal get to split that 100 dollars across the media speeches writers and that in the road show. So for instance if somebody feels that performance management suite is the most important feature for them, they will head in a look at 100 dollars in value of the performance side of things–and see them for their efforts are instead far more of somebody cares more about language they would actually… They were actually 70 dollars on the language and let’s say 20 dollars on P.D.F. Now based on all these, this actually gives me a great way to figure out what really matters, and what bubbles up to the top. So based on all this conversations, the number one thing that came up in this 100 dollars test was the performance management suite itself and the performance improvements. So clearly the next version of the product will be on same horseshit. Security. And then offered by P.D.F. and all this is a live edition that I do with our customers and developers and I'm sure many in the audience who are here to spark ask that actually. In this hundred dollars this. So you spend a lot of your time talking with cold fusion users around the world. Absolutely that's correct so be it in conferences video use a group I love to undergo fusion understand how that solving the problems of the half with. That that it's great that you're listening to you know the real world problems that people have and then you have you look I know you have like an open bug list that shows outstanding bugs the you analyze that which ones are most important to fix first store. Yes So I don't necessarily look at their faults like they do have an engineering team who do who focus on fixing itself so you have already indicated. Look at all possible in the law and make sure that we fix those walls with this because that's the portion of the product let me just break down Michael just just knew that Mike. All right so glad you're back so one thing I know people often are me is how long will you know have a commitment to cold fusion can you speak to that. OK so I want to touch upon how will this doing for there to be over the last few years region has been generating significant revenue bionics its own girl office well it's only a minute that people assume that it's it's no longer grueling it's actually on its decline numbers killed it and it actually I tracked it playing it well is saying you know we're here just as a great number for any product I bet it will be slow so it will be split commit it to the plateau you see because the business is doing well. We'll be going to remain with the product as well and also just to let you know about our support commitments with every motion of the project be have five years. that's sounds like a great commitment you've made and just the folks who are clear extended support means you keep on issuing hot fixes for security issues through that date. Yes the goal support is more on the second route the security fixes so let me just clarify that so during the course of just five years from the day from the date of the release so we keep providing proactive security fixes and hot fixes that sit in the first fight now the next two years we provide additional support to make sure that our customers Mike they do a more recent who wish so that is what extended support is far so the whole product of security fixes in our fixes will happen in the first five years and plus two additional years to make sure that we help our customers in is that somebody still stuck with it or to watch the product we provide them full support to ensure that the right of the city work arounds necessity of migration Ponce to move them on to believe this Bush that's the seventy year support and I was referee. Great while excited about that so let's just switch to a related topic which is why you're proud to be involved with cold fusion. Absolutely so I can talk about that so I think of being associated with the product for like living years now so I joined the team as an engineer trying to with various features a cold fusion eat that was a Reserve was going on back then so I didn't have any idea what color fusion is a glass of wine a junkie I was basically from a job that now the first day when AG trying to do I was asked of other validations using. So I didn't know anything about or vision of the job I will. Now I did the research first and I started using Corp to build this application I was even five big of about the A sample of up. What happened was I started building it in the morning and but evening I was in for two for happen after the publication of the South I was able to pull this occasion it was a simple application of course are complex allocation where. Do I have five D. Is it true that I was able to build it in less than a day and that's when I fell in love with the technology the productivity associated with the platform at South. So I fell in love with the technology right from. And after that have really made a speech acquisition has been great for me because I transform from a role engineer a product management drove the business side of things so personally has been a true story for me from folks from where I was in many years and years ago to be. The chip that actually am right now and also one thing that really excites me as a contribution that we made to walk us through this vision place a critical role in our customer base so recent survey that we did we realized that seventy six percent of our customers who give full vision a critical critical reading of five one five so I answered a question like How important do you rate cold fusion to be. One being least important five the most important seventy six percent give a five one flight which means that we have part of a critical of the Companies Act helping our customers very critical applications using the platform because it's a productive plots all with such a small P seventy percent of Fortune one hundred. Fifty percent of Fortune five hundred who are fusion and expect that if it is beat adopted and used saw very well across I asked him a bit this really makes me feel proud to be associated with such an interesting blast off for a level. That's great so sometimes you know I've seen blog posts out there saying Cold Fusion is dying which seems pretty ridiculous but I've been saying that for more than ten years and it seems to be getting better and. But my question for you is what would it take to make cold fusion even more life this year. Be it between the within a group B. B. A being trying to make sure that you know good fusion that it gets dark more focus and be devoted not more time to make provision even better or what is the transformation from the product. That I spoke about that is one thing that it will be has done you also came up with. You know to have the New York to have just. Hundreds of it to see some of it which will happen sometime this year absolutely some things of it will be as now one thinks that we definitely need to people who from within it will be has a lot of the poor vision developers is that you know that perception out there it's only a negative perception that is out there that is flying around saying the color vision does not do as well does not perform as well it's an excellent she so we're going to be trying to try to kill that perception by having to estimate the musicians with the trust must even with industry analysts I just got to read fact it recently had a proposition but got. It in the building them about your friends on the part of the last yes and they were really excited to know that it's that there's so much happening in the visual side of things and it's really a myth that vision is a dying dignity I think we as a group being asked the developer community need to make sure that out the message that it is only a section that vision is a day and acknowledging it is actually aligning grueling and happy and the product itself actually I think I think we asked them you know really in a strong week communicate their message to all the stakeholders even if there's a new C.R. you know was who was Johnny can you. We should be able to tell them that is the best to. Have him back so it was a pity that the line in front of us. DI is great and you know I've had a lot of conversations on the podcast about this and that so many cool things people are doing with cold fusion from you know micro services to come on line interfaces people are using with it it's amazing what people have created using cold fusion so I think we getting the word out on on the cool new apps that listeners are creating would be a good thing and if anyone has a cool thing they're doing with cold fusion please reach out to me and I'll be happy to have featured on the show so. Great so I know you're going to see if summit in November and Last Vegas What are you looking forward to at that conference whose vision summit is really a great place for me to interact with a whole range of Neverland as it's the largest development in France that. Last year we had more than five hundred plus Again nice in fact we always loved the conference if you just wanted a limited set of numbers and somehow always it plans of the. Laws are the ticket so I'm sure that's going to happen this year as well as the numbers are growing every year for me beside it is all above all other platform looking to our level of. What exactly what could be should some of this not just the full featured look at the decision makers also who are visions so it's most of the decision that definitely is know the power of the black hole the vision meet with the new addition make the other one so and reprehensible. So full of emotion some of the wants to create a platform not just a definite place to exchange interesting ideas and get to know what's happening but also influence the decision makers to let them know that vision is a really great technology and are a lot of interesting things happening on the platform it's sad. And also the line about the sessions that we have so we have all the sessions happening this year previous tracks over the two big conference we also have shots happening at the Pentagon friends so a lot of interesting stuff and just the fact that I get to interact with so many new faces so if you've got a side to see that you'll see that you will see so many new faces that you never met in any of the other conferences you will see. Some of the new day look at this and to be great to have a position with them to understand they've been using all of the learning the platform of the like the black hole all these customers Asians I just could reach and some are just just like you know what do you want is to a lot more for the WHO says if. Well that sounds really exciting and I had a conversation session with Alicia from Adobe all about call fusion summits are linked. Into the show notes for people who want to hear we exciting details on the event so I really appreciate you joining us today I know it's kind of late in the day for you there in India. And I you know I hope we get a chance to talk with you again on the part cost and if you truly love the job with the park absent documentary. Great OK Well thanks so much for actually And thanks a lot for all the work that you're doing with the forecast you're doing a great job. Next Post → CF Camp 2018: Madness in Munich Part Four- ORM–Love it or Hate it?